Attribution models are no longer limited to Last Click and First Click, since an increasing number of advertisers have started to create their own. In recent years, we have read articles dealing with the possible end of the Last Click era. However, it continues to be the most popular attribution model among advertisers. But why is it bound to disappear? The Last Click model is the most widely used attribution model nowadays. Attribution models aim at defining the extent to which all of the digital marketing levers that are used participate in a conversion. This may vary depending on the conversion. 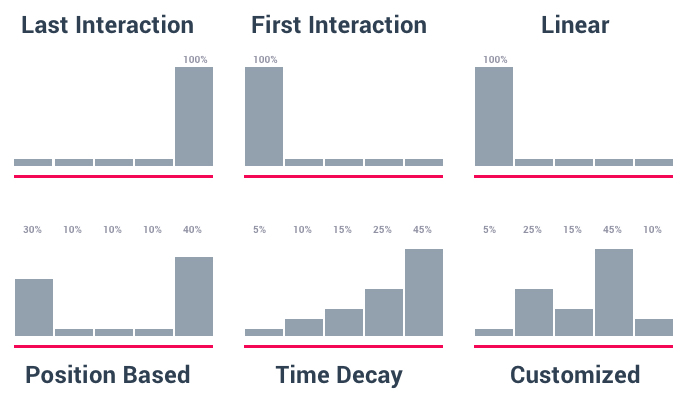 As for the Last click model, conversions are attributed to the last touchpoint. The preferred attribution model depends, in most cases, on the industry and the website type. The customer journey aims at identifying the levers that played a part in a conversion. It is rare to come across a transaction in which a visitor had few interactions with the brand prior to making the purchase. These interactions may vary in types: the site was accessed directly, a newsletter was opened, engagement on social networks occurred, interaction with the call-center took place or other levers intervened, such as display, affiliation, SEA, etc. Understanding the customer journey thus consists in tracing and pinpointing the position of all participating levers throughout the journey prior to the purchase. Some levers have simply developed a brand’s notoriety, others started the purchase process, some others contributed somehow and another lever ultimately allowed the transaction to occur. But how do you get to know the path that your clients preferred? Obviously, in order to have a rather realistic view of your clients’ journeys, you should be able to see the different paths they engaged in according to very precise segments, which is one of the possibilities offered by our solution. Major differences can indeed exist depending on the segments. What are the attribution models available? With the Last Click model, a conversion is attributed to the lever that was activated right before the latter occurred. This model does not consider the levers that were activated prior to the Last Click and that might have played a part in the acquisition of leads and contributed to lead nurturing. It is in fact extremely rare that a single lever leads to a conversion. Why is the Last Click model bound to disappear? Debate around Last Click attribution has lasted for a few years now, and this is due to two main reasons: this model has been the default model in the market for a while and has very often, if not always, been used by web analytics solutions, but it is not the best attribution model to represent reality accurately. In fact, the Last Click attribution model belittles the part played by display; affiliate websites and pre-targeting in conversions, since they often appear at the beginning of a customer journey leading to a purchase. Therefore, they are seldom considered as conversion levers. Sometimes, the last lever that intervenes in the process actually plays a minor part in a conversion. Nowadays, media plans are cross-channel, making conversion attribution more complex. A detailed analysis of customer journeys, made possible with the new Campaign Analytics solutions, allows advertisers to know precisely to which extent each lever contributed to each type of conversion; this lets them build their very own tailored attribution models. Last Click, First Click, tailored attribution models; what does all this really change? Choosing an attribution model is a major economic bet for marketing professionals. It entails knowing to whom and to what degree each and every conversion should be attributed, allowing fair payment for all participating partners. In addition, by providing reports on campaigns from which conversions originated, attribution solutions point marketing departments’ investments in the right direction, toward the best performing levers. What is at stake is thus compensating best-performing partners correctly and allocating budgets in an optimal manner.